Simplicity: A crib, a changing surface and a rocker, above, are about all you need for a baby room. Remember, the room is for sleeping and playing. Congratulations – you’re going to be a new parent. 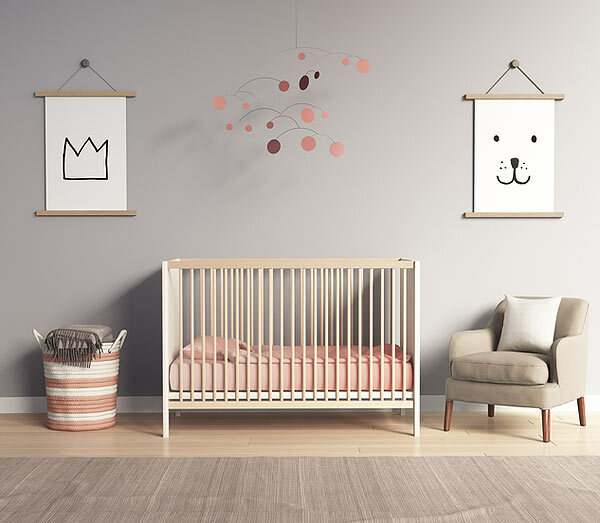 We’re sure you, like everyone, is tempted to spend whatever it takes to achieve absolute cuteness when furnishing and decorating a nursery. But you don’t have to spend a bundle. Here’s how to make it cuddly and sweet – without breaking the bank. You need a crib, something to change the baby on, and a rocking chair. That’s about it. Notice that we didn’t say “changing table,” because any flat surface – as long as you have a changing pad – is fine, as long as it’s safe. Don’t forget that you don’t have to actually purchase everything. Or if you do, get it used. It’s a waste to buy brand new furniture, since kids grow out of it so fast. Head to tag sales, garage sales and estate sales for gently used furniture that can be sanded and repainted with non-toxic paint. Since it’s fall, check out olive green, dark grey and solid browns for boys. For girls, chocolate brown with light pink is popular. Some designers urge parents to be bold with orange or bright green. When you’re painting, get creative. Stencil, use stripes, or paint a mural.